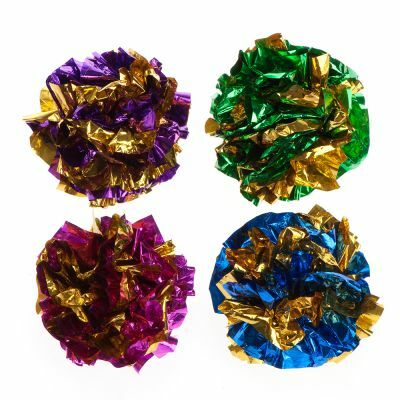 Funny little toy balls made from shiny, rustling foil. Very light so perfect for throwing games. The uneven surface makes it easier for your pet to grab. Pack of 4. Diameter: approx. 4cm. Little footballer :"My indoor cat doesn't have much time for any toys but she likes to play with stones, kicking them around the room so I tried these for her and she absolutely loves them! I feel like shes now joining "
These colourful, cheerful balls are a great toy for cats and kittens alike. 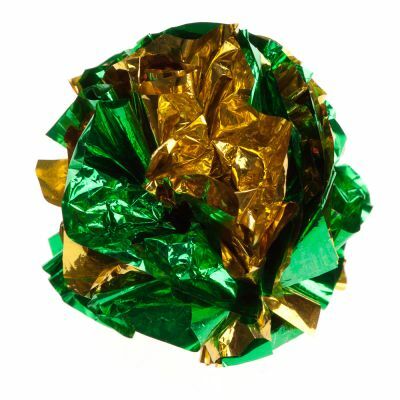 Made from bright rustling foil they are perfect for games of chase and they are so light that they simply fly through the air when your cat pounces. A great toy to indulge your cat’s natural hunting instincts. 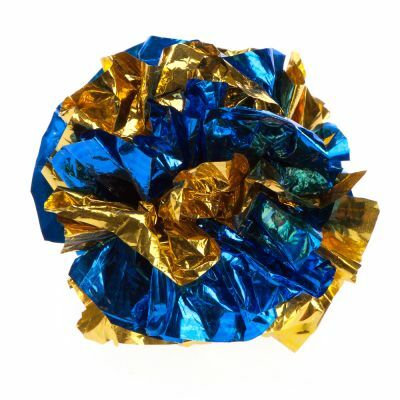 The slightly uneven surface means that it is easy for your cat to grab the rustling toy ball and throw it around and there is no predicting how or where it will land! As with any other product, please supervise your pet with this toy. Check the product regularly for damage, and replace the toy if it is damaged or missing any pieces to avoid potential injury to your pet. My indoor cat doesn't have much time for any toys but she likes to play with stones, kicking them around the room so I tried these for her and she absolutely loves them! I feel like shes now joining in at playtime. Everytime she walks past on she kicks it off to the side its so funny! My kitten loves these rustle balls and actually retrieves them in her tiny teeth, dropping them at my feet for interactive play and also dribbles them around the house like a mini football, After a good few weeks they get a bit squashed but it's easy to fluff them out again. Simple but very effective. This is always her favourite things to chase. buying these ones she still loves them so will probably be buying again when all of hers disappear again ha. both of my kitties, (Colin, 11yo moggy and Fistandantalus (Fisty for short) 2yo Ragdoll) absolutely love these. There are literally dozens scattered around the house. i keep thinking they're playing with a wrapper or something else they shouldn't have. They both go mental for these but it's nice to see the 111yo playing like a kitten. there aren't many toys that get him going, but these are his favourite. worth every penny. they're super cheap too so i add them to every other order. By far my Ragdoll boy's favourite toy, and possibly the only type of toy he really loves. He'll go crazy if he hears the sound of these being picked up, and run straight to the stairs as that's where I usually throw them for him. He is a very lazy cat but these keep him active for hours! Really wish they were bigger as they get stuck everywhere and are difficult to throw far, but cats are still happy. Loved by both young and old! I have 2 boys who go mad for these. Both Fistandantalus, who's 1½ and Colin, who's 11½ absolutely love these crinkly balls of fun. It's awesome watching Colin revert to being a kitten again when playing with these. I'M sure that i'll be buying more in the future. 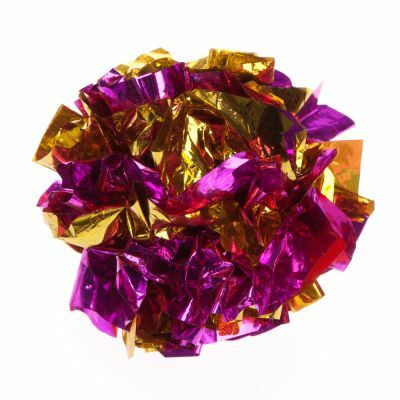 Our kittens love these and chase them up and down the corridor like mad things. We're on our second set as they keep sneaking off with them as 'kills' and hiding them. I have 2 cats and they like these balls. They carry them around and throw them in the air. Cat's have different tastes in food and toys. My cat wasn't even the slightest bit interested in these, although she goes crazy for the foam balls. I ended giving these ones away to someone who hopefully has a cat who'll appreciate them more than my cat did. My 12 week old British Blue, Billy can't get enough of these! He'll come running as soon as you scrunch it in your hand. I agree they do all end up under the sofa (which he's too much of a scaredy cat to retrieve) but who cares? Happy to keep collecting them back up for him! For active crazy kitten antics these noises rustling balls end up everywhere around the house. They are also great to be carried in the mouth and given to humans as a present. However, they do tend to just vanish...probably under the sofa. Who knows? My cat loves them, but the balls is too tiny. Please bring back the large balls! These balls have been a real favourite of my Ragdoll's, however he was hugely disappointed with the last order as the balls are tiny - please bring back the larger balls that we have had over the last three years!!! Only toy my bengal likes! If only they did the bigger version as we go through lots! 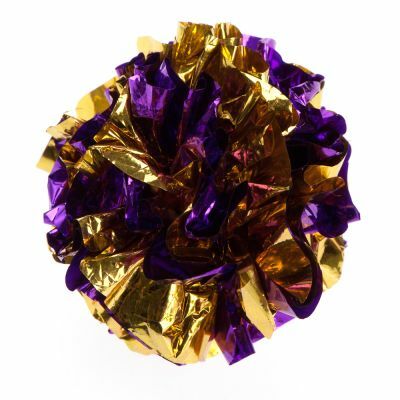 My two kittens love these rustling Pom Poms! My 5 month old even plays fetch with them and will carry and drop them for me to throw. Excellent entertainment. Have a pack on stanby as she tends to drop them in the water bowl haha. Great price too. You cannot go wrong!